Your exhaust system takes the used up fuel and air charge from your engine, cleans it of its hazardous pollutants, and silences it before pushing it out the back of the vehicle. Common components of the exhaust system are the exhaust manifolds, catalytic converters, flexible sections, center pipes, exhaust resonators and mufflers. These items work in harmony to reduce noise and vibration, remove heat, and eliminate harmful emissions from the engine. If your vehicle is loud, lacks power, or has an emissions light indicating a catalytic converter problem, your exhaust system is likely the problem. 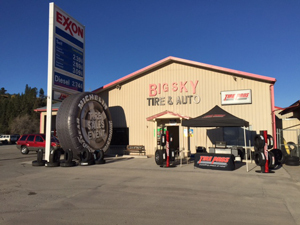 The experts at Big Sky Tire Pros can quickly identify and resolve the problem in a timely, cost efficient manner.